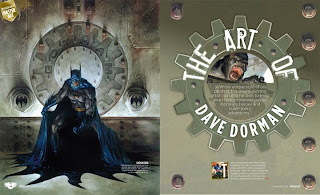 Dave's Ravings: Dave Interview in IMAGINEFX Magazine! 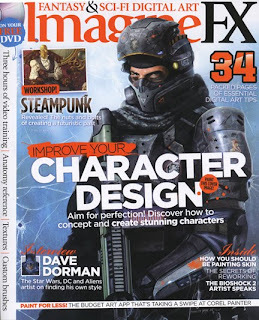 Dave Interview in IMAGINEFX Magazine! Hey everyone! Happy Holidays. This week a special gift for me and my fans and followers. The SCIFI/Fantasy Arts Magazine IMAGINEFX is running a 5 page interview/profile of me in their Issue #51, on sale in the USA this week. Subscribers and readers overseas ( it is printed in the UK) have had their copies available for a couple weeks already. But you should head down to the local bookstore and grab a copy pronto! ABOVE is the cover to the newsstand edition and below is the subscribers special cover. The article covers my work and thoughts on art and painting. Some reminiscences and loads of cool art. Here is the opening spread of the article. I would like to personally thank Claire Howlett for initiating contact and being such a wonderful editor for a great magazine. 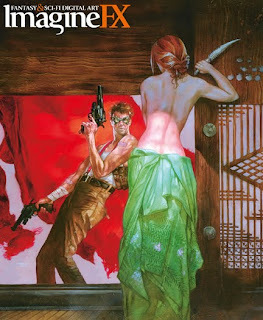 She and I met in San Diego at the Comic-con and it was a charming conversation with someone who obviously loves this genre of art. And a thanks goes to the writer of the article, Garrick Webster, who took my almost incomprehensible answers to his questions and made them understandable and entertaining! There was one bit of information in the article I would like to clarify. At the end when it mentions my up coming projects, The RAIL sequel (the WASTED LANDS Graphic novel) will be coming out NEXT summer.. fingers crossed.. and not right now as indicated in the article. I know a lot of you have been asking about it and I am working on it , finally. when that issue dropped through my letterbox,i was the happiest boy in the whole wide world,dave. what with your work appearing on idw covers and various other places,i hoped for dark horse to offer you the chance to reclaim your position as the premier star wars artist.